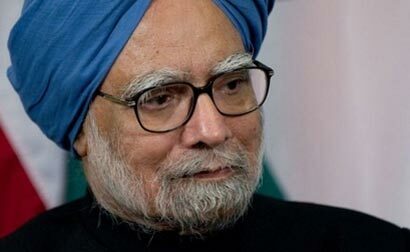 (Reuters) – Prime Minister Manmohan Singh on Friday ruled out serving another term after an election due by May and threw his support behind Nehru-Gandhi dynasty scion Rahul Gandhi to lead India if their party wins the vote. Singh, 81, has presided over India for a decade at the head of coalition governments led by the Congress party and was widely expected to step down. Gandhi will have his work cut out if he’s chosen to lead the Congress party into the election with corruption scandals, stubborn inflation and decade-low growth eroding support, opinion polls show. “In a few months’ time, after the general election, I will hand the baton over to a new prime minister,” Singh said at a rare news conference, adding that a “new generation” would guide the country. Singh said Gandhi, 43, should be the Congress party’s prime ministerial candidate. The Congress is due to hold a top-level meeting on January 17 and is expected to announce its candidate soon afterwards. Whoever gets the nod will face off in the election against Narendra Modi, of the Hindu nationalist Bharatiya Janata Party (BJP), who is ahead in the opinion polls. Modi is campaigning on a platform to revive an economy growing at its slowest in a decade and end the red tape and corruption that have bedevilled the Congress-led coalition. The Congress fared badly in elections in four large states towards the end of last year, largely due to voters’ anger over corruption. Compared with the relatively untested Gandhi, Modi has years of experience as the chief minister of Gujarat where he has built a reputation as a business-savvy and investor-friendly administrator. But he has been unable to fully shake off allegations over anti-Muslim riots in Gujarat in 2002 in which at least 1,000 people were killed, most of them Muslims. Modi denies wrongdoing and a Supreme Court investigation found no evidence to prosecute him. Singh was scathing about Modi, saying he would be bad for India. “I sincerely believe that it would be disastrous for the country to have Narendra Modi as the prime minister,” said the softly-spoken Singh. Singh rejected a suggestion that he had been a weak prime minister and again referred to Modi. “If by strong prime minister you mean that you preside over the mass massacre of innocent citizens in the streets … I do not believe that sort of strength this country needs. Least of all in its prime minister,” Singh said. BJP spokeswoman Nirmala Sitharaman said on her Twitter account she was “utterly disappointed” with Singh’s remarks. In what was seen as his farewell news conference, the prime minister took a conciliatory tone on a dispute with the United States over the arrest of Indian diplomat Devyani Khobragade in New York. Singh said the government was committed to good relations between the two countries. “There have been recently some hiccups but I sincerely believe that these are temporary aberrations and diplomacy should be given a chance to resolve these issues that have arisen,” Singh said. Thank you Mr Singh for departing so graciously. You have had one foot in your grave for long and it is time the other foot went in to where it belongs and spare India, its neighbours, the pain and suffering you caused in the past 8 years. Mr Singh, please mind your own business and let the Congress pick its leader through a democratic process instead of pining for happy-go-lucky playboys.